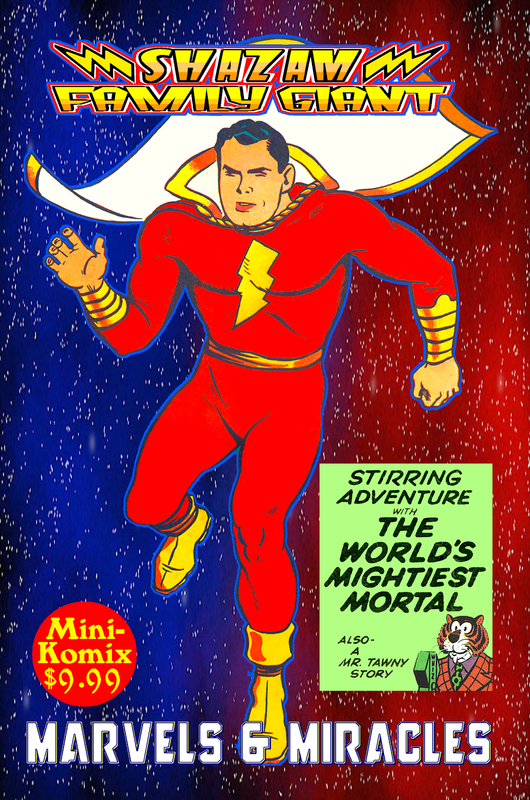 Shazam Family Giant reveals Marvels And Miracles! The original Captain Marvel soars in a cosmic collection of his Golden Age adventures! Learn the secret origin of the World's Mightiest Mortal, plus he meets Mr. Tawny, hits haunted armor, strikes down Dr. Sivanna, intervenes the Island Wrecker, goes after a gorilla, halts the Human Hawks, and takes a trip to the moon! 100 Big Pages! You can order this in print through us, or at Lulu, also in digital at Drive Thru Comics, plus as part of the Shazam Family Giant Collection Bundle.